Chabad of Uptown and personal diary updates! Please comment on our posts, we would love to hear from you! 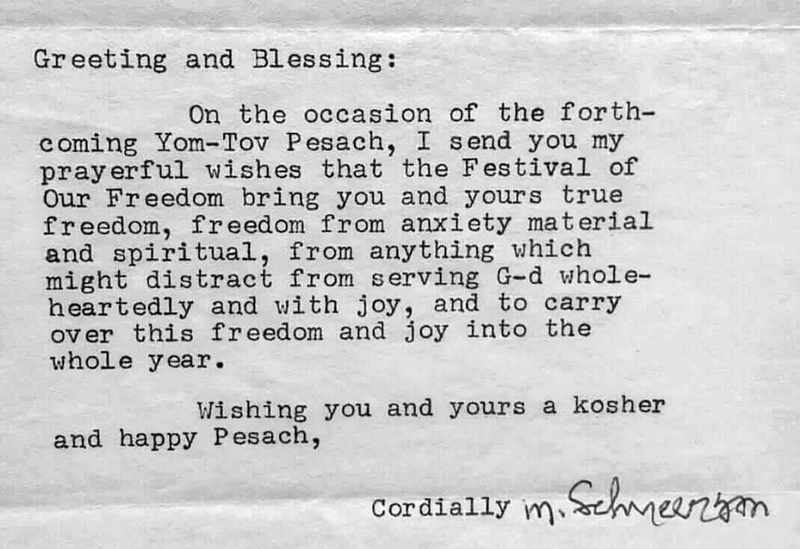 "Pesach year free of anxieties"
We look forward to seeing our Uptown community throughout the holiday, the complete schedule is below. 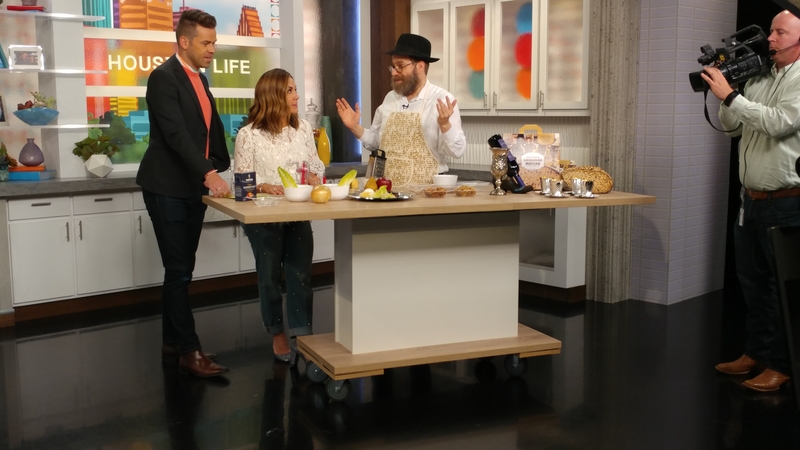 This year, our Pesach activities were covered with a charoset cooking show with Courtney Zavala & Derrick Show on Channel 2's Houston Life with and Pesach food demonstrations with Sally MacDonald on the 9 am Morning News on Channel 26 (backstage clip with Jose Grinan). Now, back to making marror and Charoset!! What a trip! Celebrated the wedding of Rabbi Chaim's youngest brother Shmuly and extended the trip for a tour of a lifetime. Especially special for the kids who have never been to the heart of our life - The Holy Land of Israel! Have we got a gift for you! There is nothing like handmade Shmurah Matzah. Our sages teach that its best to use hand made Shmurah Matzah for the seder, especially for the middle matzah of the Seder plate, the matzah we make th eblessing and fulfill the mitzvah of eating matzah at the seder. 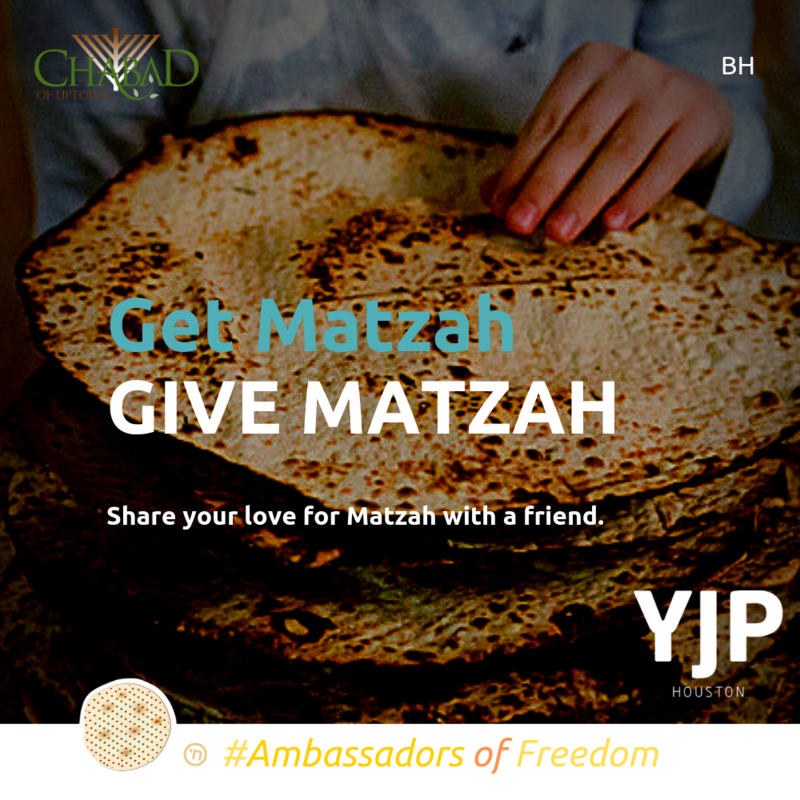 This year we have a special campaign to raise Shmurah Matzah awareness. Please think of whom you can share a matzah with and we have special gift packs for you to use to share shmurah matzah with a Jewish friend. Just reply to this email when you would like to come pick it up from Chabad of Uptown. Review (& attend :)) the complete shul schedule....! This Shabbat, the Shabbat before Passover is termed Shabbat HaGadol ("The Great Shabbat") in commemoration of the "great miracle" that happened in Egypt on this day, heralding the Exodus from Egypt five days later. Shabbat HaGadol customs include reading a portion of the Haggadah (see schedule below), which tells the story of the Exodus; it is also customary that the rabbi of the community delivers a lecture in which he elaborates on the laws of Passover and their significance, in preparation for the festival. This week we take out three Torahs! One for Parshas Tazria, one for Rosh Chodesh Nisan and one for Hachodesh! Mazel tov to Rabbi Chaim's brother Shmuly & Hayley Lazaroff on their marriage this past week in Israel! It was amazing to celebrate with the whole family together in the Holy Land. A great time was had by all. 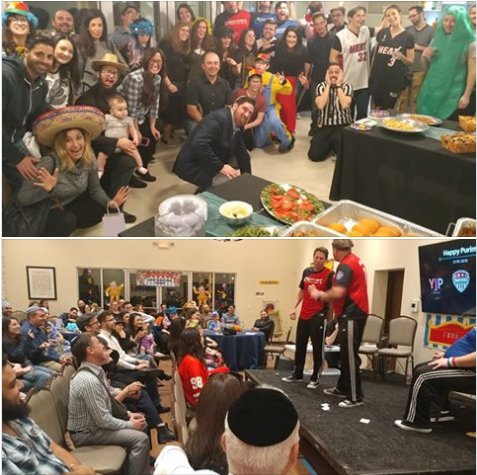 What a Purim celebrating with over 250 Uptownians around the clock! Pictures iy"h next week! Thank you to everyone who helped put it all together, mainly Irit Busany, Guya, Melissa Feldman, Rachel & Elliott Levine, Naomi & Rachel Lishansky, Guitel Melnik, Sigal Melnik, Bernard Mendoza, Naomi & Elchonon Reizes, Chanan Wolf, Ian Zlotnik, all of Lazaroff kids, Mollie Karni and crew! SCHOLAR IN RESIDENCE: Next Shabbos, Parshas Parah, March 29-30 we will have a special guest over the weekend, Rabbi Saul DJanogly. He will be speaking in Shul on, "What’s the secret of financial success?" and "My personal journey-from Jekyll and Hide to Chasid". Rabbi Djanogly, is an unusual Jewish educator in that he earns his living as the owner of a successful wealth management business and has a great passion & hobby through adult Jewish education in which he has been actively involved for nearly 30 years. 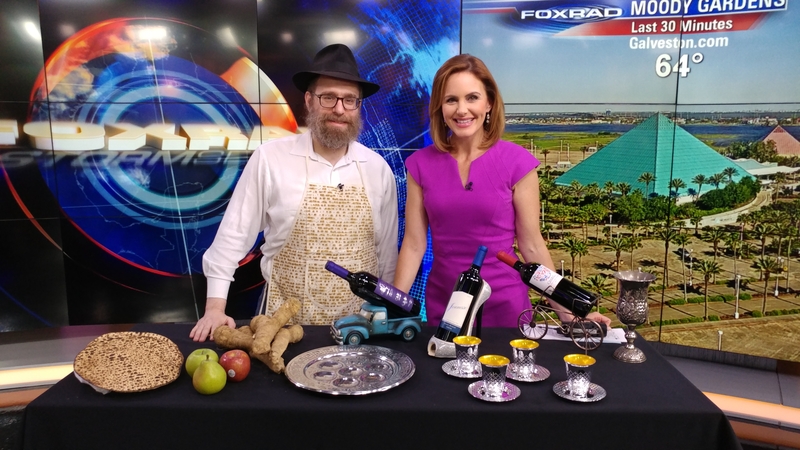 ⇛ Its not too early to talk about Pesach! Check out our Pesach site as well as make reservations for our seders, including a special "social media" seder. PARSHAT ZACHOR: This being the Shabbat before Purim, on which we celebrate the foiling of Haman the Amalekite's plot to destroy the Jewish people, the weekly Parshah is supplemented with the Zachor reading (Deuteronomy 25:17-19) in which we are commanded to remember the evil of Amalek and to eradicate it from the face of the earth. "Parshat Zachor" is the second of four special readings added during or immediately before the month of Adar (the other three being "Shekalim", "Parah" and "Hachodesh") Links: The Zachor Reading with commentary, More on Who Was Amalek? When Adar begins, increase in joy! Join us for the Rosh Chodesh minyan in a few hours on Friday, March 8 at 6:45 am! ​Crown Heights Shabbat was epic! Chanie led the opening candle lighting session with hundreds experiencing a complete immersion Shabbat in Crown Heights! Completing of Book of Shemot, with "Chazak"! DOUBLE SHABBAT! Last Shabbat, Chabad of Uptown's cteen joined teens from around the world with 2600 participants from 6 continents, 400 cities, 30 countries - the largest yet! You can watch CTeen take over Times Square on Saturday night with Havdalla and concert at www.chabaduptown.org/cteenlive. This Shabbat, YJP Houston is in NYC!! Chanie is leading a group of Houston delegates with reps also from around the world! DOUBLE THE STUDY! Did you know we offer two classes every Thursday? At the Thursday noon class we have learned subjects in many stages, beginning with the study of the applied Parsha, the entire book of Tanya, five selected Chassidic discourse of the Rebbe and most recently three chapters of different areas of Talmud discussing the financial obligation of neighboring condominiums, Shabbos cooking and Grace after Meals. The class will now focus on another area of Torah, halacha. We will start from the beginning of Shulchan Aruch Harav, Chapter 1. Join us! DOUBLE ADAR! It is also Shabbos Mevarchim for Rosh Chodesh Adar! We will have our monthly breakfast on Thursday! See schedule below! DOUBLE THE FUN! Look out in your mailboxes for Purim for the community of all ages and Young Professionals, including megillah readings around the clock! Mazel tov for the birth of a baby boy to Chanie's brother, Rabbi Mendel & Chyena Galperin! CTeen is off! 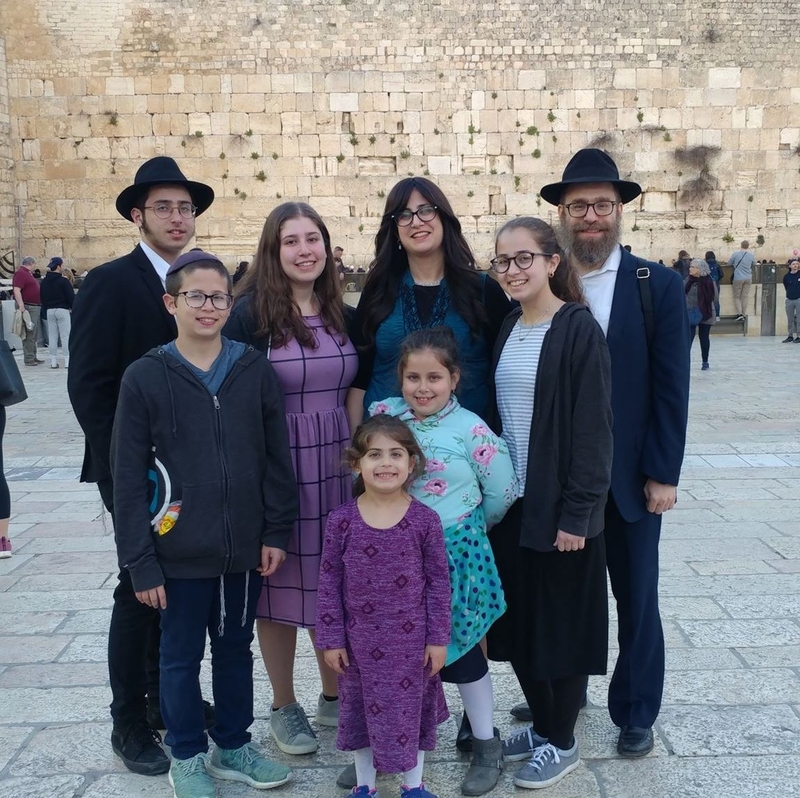 Chabad of Uptown's cteen has joined teens from around the world with 2600 participants from 6 continents, 400 cities, 30 countries - the largest yet! You can watch CTeen take over Times Square on Saturday night with Havdalla and concert at www.chabaduptown.org/cteenlive. Look out in your mailboxes for Purim for the community and Young Professionals, including megillah readings around the clock! Being in the month of Adar, it is an opportune time to celebrate the topic of happiness, as our sages taught us: Mishenichnas Adar marbin besimchah, “When the month of Adar enters, we increase joy.” This is especially so this year, being a Jewish leap year that contains two months of Adar, or sixty days of joy. Next week is Purim Katan on Monday-Tuesday, Feb 18-19. We will have a farbrengen on Tuesday at Chabad of Uptown at 8 pm. See below. We are excited to inform you that the Purim plans for Chabad of Uptown and YJP Houston are unprecedented and will be over the top awesome! Condolences to Baruch Shkertzi on the passing of his grandmother, Hagar bat Regina, a"h, in Israel. May her neshama have an aliya. YOUNG PROFESSIONALS! It's not too late to join us for the NYC Shabbaton with YJP's from around the world! www.cypshabbat.nyc! Thank you Susie Eshet for helping bake this week's challah! Mazel tov Guy & Melissa Ohan on the birth of their daughter, Lia Gabriella! Condolences to Ziggy Gruber on the passing of his father, Gene Gruber, o.b.m. Besides for the bar mitzvah number of thirteen, there are thirteen gates to Heaven, though which we pray through thirteen gates of prayer, reaching the thirteen attributes of mercy. These thirteen years have been spectacular, as can be seen in our 13+ years of our website's photo galleries. We are so thankful for each and every one of you, who make this community so special. Thank you for being a part of this amazing experience of Chabad of Uptown. The Rebbe taught us to never rest, we continue to forge ahead with renewed strength and endless possibilities. Uptown, Upward and Onward! This Shabbos we kick off February with First Fridays and a Shabbos Mevarchim kiddush - BOTH MARKING 13 YEARS OF CHABAD OF UPTOWN! Please join us! What a way to close a fantastic week! This past Sunday found Chanie sitting at a table at the International Conference of Chabad-Lubavitch Women Emissaries (Kinus Hashluchos) at the New York State Armory in the Williamsburg section of Brooklyn, N.Y., together with 3,000 other women emissaries and lay leaders from 100 countries with Chabad presence... The energy was amazing and you can watch the replay of closing session here. Please join us on Tuesday for the monthly Rosh Chodesh minyan and breakfast! See the full schedule below. Chanie has joined 3000 physical and spiritual sisters for the annual Chabad women leaders convention this weekend. Every "Shlucha" is a leader in their community. This annual event is an inspiring display of perhaps the largest group of women leaders in the world. You can watch the the annual banquet, the culmination of a five-day International Conference of Women Emissaries on Sunday at 4:30 pm, www.chabaduptown.org/kinus. Chanie's sister Raizy Rubin is the keynote speaker! Talking about women, the Jewish Herald Voice ran an article this week, featured on the front page, about the women's dessert and discussion help at Chabad of Uptown as a joint project of the Chabad Centers of Greater Houston. Check out the write up and the featured short clip of Chanie's class where you can get a taste of what was shared. Next week, 26 Shevat, marks 13 years since our inaugural Shabbos, the opening of Chabad of Uptown in 2006. We thank each and every one of you who took part in making Chabad of Uptown come of age! What a journey it has been! Young Professionals: Join us for a special 13th anniversary First Fridays Shabbat dinner over Japanese cuisine, on Feb. 1. Click to RSVP free before Thursday using coupon code "advance"
Community: Join us for a special 13 anniversary Kiddush, on Feb. 2. 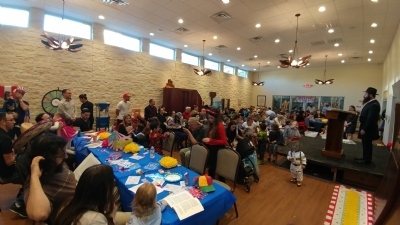 Followed by Shabbos Lunch Kiddush sponsored by Shlomi & Tamar Benhamo, marking the completion of Kaddish in memory of his father, Yosef ben Shlomo, a"h.
Thanks to Jewish Family Service of Houston, Rabbi Chaim is officially certified as a Mental Health First Aid USA Instructor by the National Council for Behavioral Health! Do you know how to recognize symptoms of mental health? Stay tuned for opportunities to take a course in the Houston area! Check out the many more pics that have been added to the album of last week's ladies dessert & discussion. This Shabbos we will be celebrating an "ufruf" for the upcoming Rosen wedding of Jon to Ashlyn Eiden as he is called up to the Torah. PARSHA: Is Your Optimism Grounded in Reality? Wow! 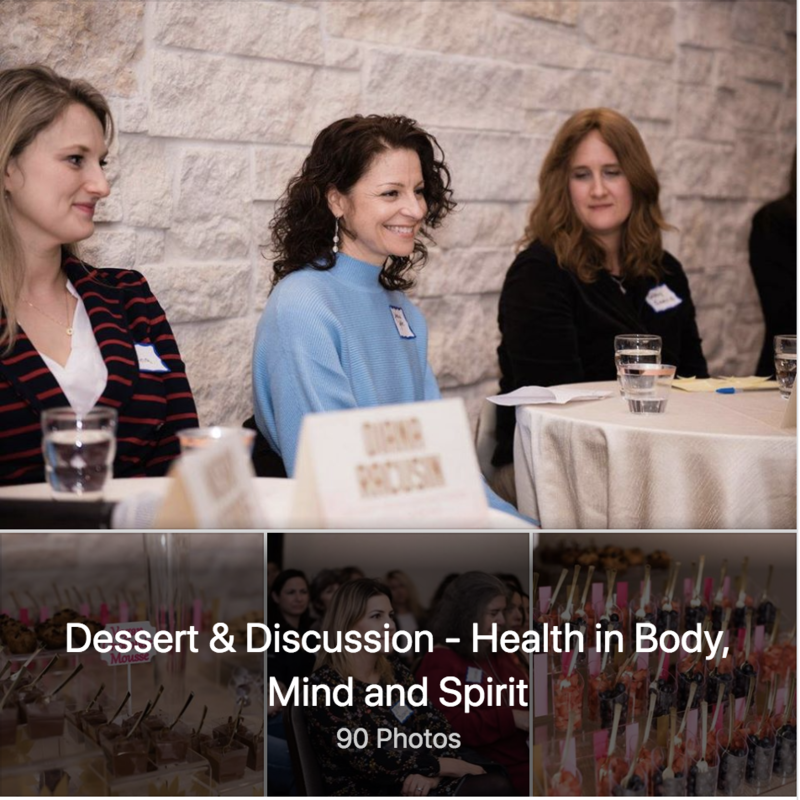 Last night Chabad of Uptown hosted all of the Chabad Centers of Greater Houston for a Ladies Dessert & Discussion on the topic of Health in Body, Mind and Spirit, The over 120 ladies were treated to a fun and fast-paced panel presentation, 🎤 featuring 4 women, 4 perspectives: -Gitty Francis, LMSW -Jacqueline Jaffe, PhD Psychologist -Mushky Lazaroff, Co-Director, Chabad Montrose -Diana Racusin, MD Assist. Professor Maternal Fetal Medicine. The panel was followed by a choice of insightful, round table breakout discussions. 💬 -Healthy Relationships -Healthy Boundaries -Healthy Parenting -Healthy Self 🍧🍫🥐🍒 All while enjoying a delicious and healthy dessert buffet! Check out a first glimpse of the pics and short video clip here. Mazel tov to Ben & Regina Shamooelian on the birth of a baby boy, Avrohom Shalom! Mazel tov to Rabbi Chaim & Chanie on the engagement of his brother Shmuly Lazaroff to Hayley Van der Veen of Tsfat! Mazel tov to Katz family on this past weeks celebration in honor of the bar mitzvah of Ariel Katz and the upcoming bas mitzvah of Lielle Katz! Mazel tov Jay & Anat Zeidman on the birth of a baby boy! One of nine Houston branches of Chabad Lubavitch of Texas, Chabad of Uptown is located in the heart of the trendy Uptown area, near the Galleria, River Oaks and Bellaire areas, offering Shabbat services, classes, holiday programs, a vibrant young professionals group and a mommy and me among other outreach activities. 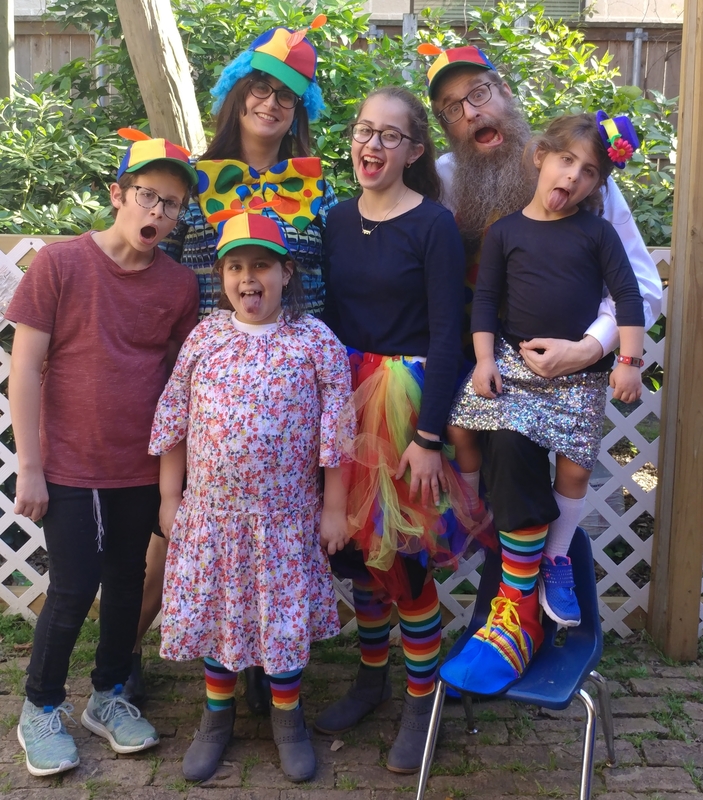 Rabbi Chaim and Chanie along with their community have created a special inclusive environment where everyone feels comfortable and welcome. For Chabad is a home for every kind of Jew. Chabad just considers you “Jewish”. There are no labels. There are no differences.